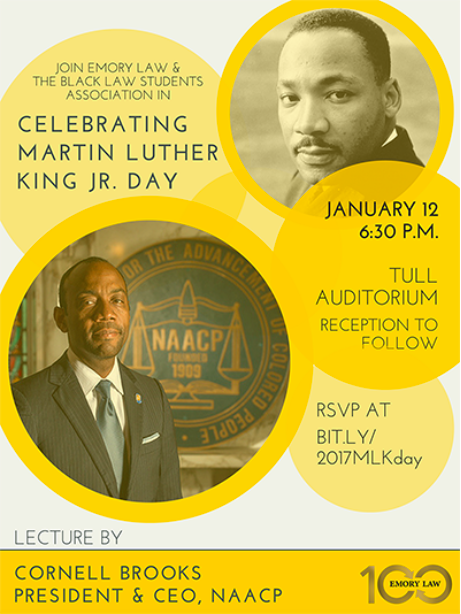 Cornell Brooks, president and CEO of the National Association for the Advancement of Colored People (NAACP), will give a lecture in celebration of Martin Luther King, Jr. Day at Emory Law. In conjunction with the Black Law Students Association, Emory Law will host the lecture titled “Why We Can’t Wait: Civil Rights on the Eve of the Trump Inauguration” on Jan. 12 at 6:30 p.m. at Tull Auditorium, Gambrell Hall. Brooks’ lecture will be followed by a reception in Hunter Atrium. Free parking will be available after 4 p.m. in the Lowergate South Parking Deck, 1705 Lowergate Drive, Atlanta, GA 30322.